Summer in Ottawa is ready and waiting for you—where will you start your adventure? As time goes by, travelling becomes even more accessible to the average jetsetter. Whether you travel for business or pleasure, you can count on getting from point A to point B with a direct flight. But did you know you could do the same from Atlantic Canada to our nation’s capital? To bring true patriot love to all Maritimers wanting to get away for a week, or even as quick as a long weekend, there’s Porter Airlines The direct flight is easy enough that you’ll be able to hop on a flight after work and be back before your Monday-morning meeting. And don’t worry, we’ll give you the perfect schedule to fit in all of Ottawa’s beauty, no matter how long you stay. There are ample “must-sees” when visiting Ottawa, from hiking through the luscious greenery to winding through the Rideau Canal, and the Lady Dive Amphibus even offers a duel-element experience. See Ottawa on land, and then dip into the water for a multilingual experience showcasing 75 attractions over the course of a 90-minute guide. The city is filled with tours that can do the hard work for you to show you all that you need to see in a few hours or less (including the best spots to enjoy multicultural dishes that help make our country so flavourful). Our nation’s foods have never had one single taste: we’re a mosaic of culture, and that’s exactly what you’ll experience throughout Ottawa. The “Experience Food” tour is just one of many that bring you the best of both Ottawa and Gatineau, where you can discover exactly why the two are top culinary destinations. If you’re more of a DIY tourist who needs to venture off the beaten path, Ottawa has enough nooks to keep you busy discovering on your own. You can hop on a RentABike, or use the reliable transit to get you to each neighbourhood without a fuss. Explore the historic Glebe or stretch outside the city centre to Wellington West: a local shopper’s dream. With fashionable boutiques, craft coffee and tea that is perfect for the latte-connoisseur in your friend group, and the Hintonburg neighbourhood is worth the walk or bike ride to discover its unique, local gems. The classic “first-time-in-Ottawa” sightseeing focuses a bit more on true Canadian treasures, where you can experience each of your heart’s desires, right in the ByWard Market neighbourhood. The ByWard Market is in the middle of downtown Ottawa and offers up the traditional Ottawa flair with a side of surrounding upscale restaurants and views of historic buildings. The Market is one of the oldest and largest in Canada where you can satisfy your sweet tooth with a visit to the BeaverTail stand or opt for savoury with personalized poutine choices. The area has even more to offer than just the day-time fun as it doubles as an active nightlife spot. You can come back afterhours for premium cuisine, Ontario craft beer and rooftop patios with a stunning view of Parliament. Ottawa is a city where the foodies can eat, the tourists can jump on a bus and the adventurers can jump off a cliff. 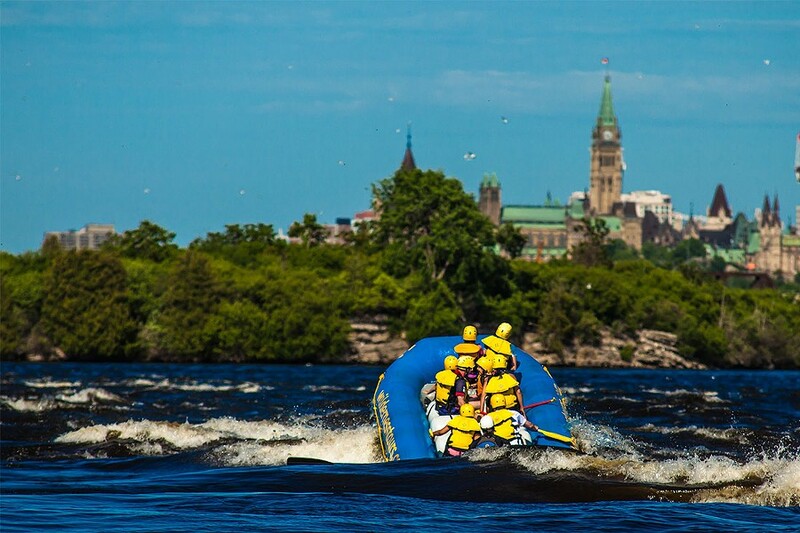 Thrill-seekers have the option of bungee jumping, white-water rafting or kayaking on the Ottawa River. All the while, tame wanderers may lean towards a spot of local theatre or a visit to a national museum with their National Museums Passport to give them the full historical experience—visitors can experience three museums for only $35! Whatever it is that you do during the day, it’s not a trip to Ottawa without a night visit to Parliament Hill. Pack a blanket and set up shop on the front lawn for the Northern Lights Sound and Light Show that tells the story of our nation through a projected light-effects show starting July 9 and running through early September. Sit back, and learn about the beauty that is Canada, right in the capital. See more of what Ottawa has in store.